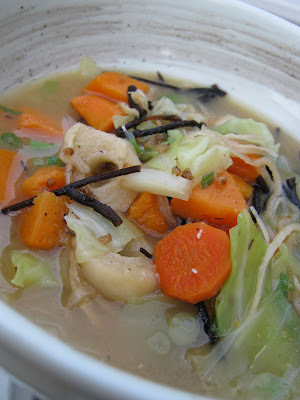 This is a picture of the Miso Soup that I made the other day which I added a lot of ingredients, such as; Carrots, Onions, Cabbage, Yams, Green Onions, Garlic Chives, Hijiki Seaweed, Kiriboshi Daikon (Dried Daikon), Fu(dried wheat gluten), and SOBA-CHA (Buckwheat Tea). I believe that eating Miso soup with a lot of vegetables (including sea-vegetables) is one of the best ways to get all the various nutrients your body needs. All the minerals and vitamins are incorporated into the soup, and that's the reason it makes the miso soup more delicious. Also eating Miso Soup is very good for your health. Such effects as lowering your cholesterol, prevents cancer, to keeping the brain active...etc. As one of many soy beans products, Miso soup is one of the best comfort food among Japanese people, I believe. As a Japanese person (woman) who lives outside of Japan, it is very important to keep miso paste in my fridge, and make some miso soup so often! And I would like to try and incorporate the miso paste into some American type of dish as my next Recipe Developing project. Hopefully, I can come up with a delicious recipe this way. Never know until you try, right!